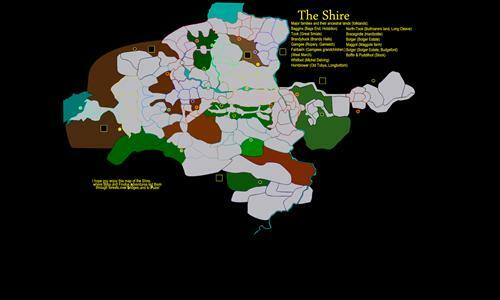 The four farthings of the Shire, and the Eastern and Western Marches. Folklands - Start from the traditional family estates. Towns & Villages - All populated areas within the Shire. Review by lluis on 1/29/2013. Nice, incredibly detailed, and original. LOTR rocks! Review by Yoshi on 3/16/2012. Review by vlagmar on 11/20/2013. Like the concept and creative naming...fun. Unfortunately I found the map too hard to see clearly due to the different colours used for the many impassible areas. Too many isolated regions with single point of entry...like having an entire world map of just Australias. It's been a while since I played this. Great work - both as a Warlight map and as a depiction of the Shire! Very nice. Layout could be better, some territories look like they are connected while they aren't (or visa versa). Review by Stijn Verhulst on 5/4/2013.